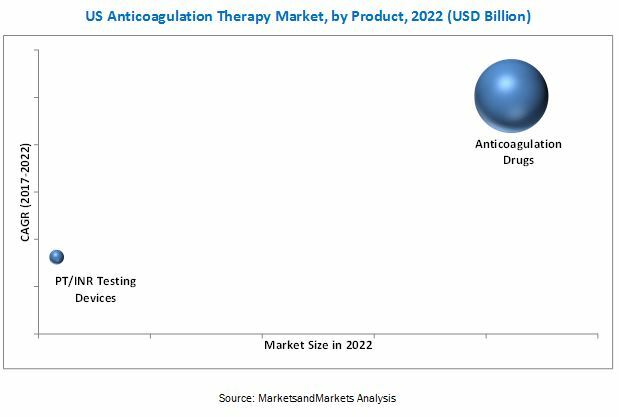 [86 Pages Report] The US anticoagulation therapy market is projected to reach USD 27.83 Billion by 2022 from USD 17.25 Billion in 2016, at a CAGR of 8.5%. The market is segmented into products (anticoagulation drugs and PT/INR testing devices) and anticoagulation clinics. The growth in the anticoagulation drugs market is primarily driven by the rising incidence of venous thromboembolism, atrial fibrillation, and stroke; long-term administration and high volume of recurring sales of anticoagulation drugs; and increasing demand for novel oral anticoagulants (NOACs). On the other hand, the high cost of NOACs and requirement of significant investments in the development of anticoagulation drugs are the major factors restraining the growth of this market. In addition, the growth in the anticoagulation clinics market is primarily driven by the increasing prevalence of cardiovascular diseases & blood disorders, high level of medication adherence associated with clinics, and rising aging population. Top-down and bottom-up approaches were used to validate the size of the US anticoagulation therapy market and estimate the size of various other dependent submarkets. Major players in the market were identified through secondary sources; directories; databases such as Hoovers, Bloomberg Businessweek, Factiva, and OneSource, journals and their market revenues were determined through primary and secondary research. 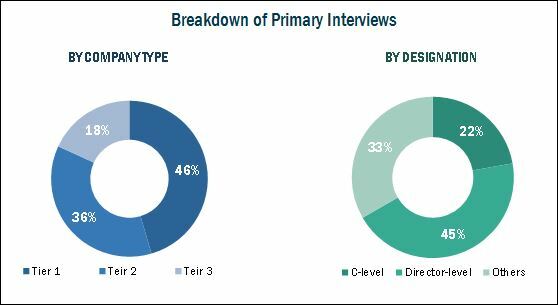 Secondary research included in the study are the annual and financial reports of top market players, whereas primary research included extensive interviews with the key opinion leaders such as CEOs, directors, and marketing executives. The percentage splits, shares, and breakdowns of the product and clinic markets were determined using secondary sources and verified through primary sources. All possible parameters that affect the market covered in this research study have been accounted for, viewed in extensive detail, verified through primary research, and analyzed to get the final quantitative and qualitative data. This data is consolidated and added with detailed inputs and analysis from MarketsandMarkets and presented in this report. The US anticoagulation therapy market is consolidated in nature. C. H. Boehringer Sohn (Germany), Bristol-Myers Squibb (US), Johnson & Johnson (US), Pfizer (US), Daiichi Sankyo (Japan), and Portola Pharmaceuticals (US) are the major market players in the global market for drugs while Roche (Switzerland), Abbott (US), Siemens (Germany), Alere (US), and CoaguSense (US) are the major market players in the US anticoagulation therapy market for PT/INR home testing devices. The US anticoagulation therapy market is projected to reach USD 27.83 Billion by 2022 from an estimated USD 18.49 Billion in 2017, at a CAGR of 8.5%. Market growth is primarily driven by the rising incidence of venous thromboembolism, atrial fibrillation, and stroke; long-term administration and high volume of recurring sales of anticoagulation drugs; and increasing demand for novel oral anticoagulants (NOACs). In this report, the US anticoagulation therapy market is segmented on the basis of products and clinics. On the basis of products, the market is segmented into anticoagulation drugs and PT/INR testing devices. Based on drug type, the anticoagulation therapy market for drugs is segmented into NOACs, warfarin (VKA), and other drugs. In 2016, the NOACs segment dominated the US anticoagulation therapy market for drugs. Due to the better safety and efficacy of NOACs as compared to traditional therapies, the adoption of NOACs is higher as compared to traditional drugs. In addition, key market players such as Portola Pharmaceuticals (received FDA approval for its NOAC Betrixaban in July 2017) are focusing on the development of NOACs in order to capitalize on the growth opportunities presented by this shift in market dynamics. Consequently, many other companies are also expected to focus on developing more safe and efficient NOACs in the coming years; this will ensure the continued growth of this segment. The anticoagulation therapy market for PT/INR testing devices is segmented into in-office testing devices and home testing devices. The in-office devices segment dominated the US anticoagulation therapy market for PT/INR testing devices. The large share of this segment is mainly attributed to the large number of patients opting for in-office testing services. However, the home testing devices segment is expected to grow at the highest CAGR due to its advantages such as convenience, time & cost savings, and quick result generation. Additionally, the cost of test devices and the tests themselves are often reimbursable. The anticoagulation therapy market for clinics is segmented on the basis of type of services and clinics. The types of clinics include hospital associated clinics, independent clinics, and pharmacy-based clinics while the types of services include testing services and consulting services. The pharmacy-based clinics segment is expected to register the highest CAGR during the forecast period. In the US, the number of pharmacy-based anticoagulation clinics has increased significantly in the last few years. This is due to the fact that better results are achieved when therapy is managed by expert pharmacists rather than care provided by family physicians. Moreover, the cost of therapy provided by pharmacy-based anticoagulation clinics is comparatively lesser than independent and hospital associated anticoagulation clinics which is expected to drive the market for pharmacy-based anticoagulation clinics. C. H. Boehringer Sohn (Germany), Bristol-Myers Squibb (US), Johnson & Johnson (US), Pfizer (US), Daiichi Sankyo (Japan), and Portola Pharmaceuticals (US) are the major market players in the global market for drugs while Roche (Switzerland), Abbott (US), Siemens (Germany), Alere (US), and CoaguSense (US) are the major market players in the US anticoagulation therapy market for PT/INR home testing devices. *Details on Business Overview, Strength of Product Portfolio, Business Strategy Excellence, Recent Developments, Key Relationships Might Not Be Captured in Case of Unlisted Companies.